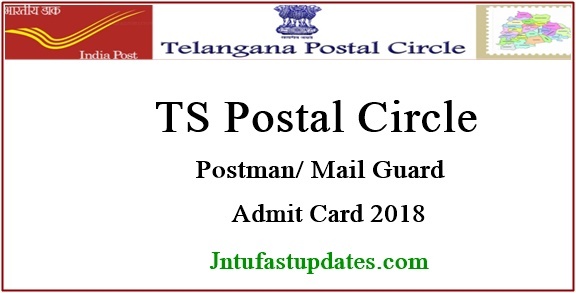 TS Postal Circle Mail Guard Admit Card/Hall Ticket 2018: Telangana Postal Circle has recently advertised 136 vacancies for postman and mail guard posts. Many of the candidates have applied for the Telangana Postal Circle postman vacancies. All the aspirants applied for the Telangana Postal Circle vacancies need to appear for the examination in the scheduled dates. All the applicants have to appear for the TS Postal Circle written test by downloading the hall ticket /admit card for the written test. Candidates who have applied for the postman jobs can download the admit cards from the official website, telanganapostalcircle.in. admit card/hall ticket is the mandatory document to proceed with the examination. Hence candidates must download and preserve the admit cards to appear for the examination. Telangana Postal Department is the state level department to carry out various postal needs. It annually announces various job notifications for the aspirants seeking jobs in Telangana. The Postal Circle, Telangana had issued recruitment notification for 136 postman and mail guard posts this year. Many of the eligible aspirants have applied for the Telangana Postal Circle jobs. The application process was carried out recently for the announced posts. The Telangana Postal Circle is going to shortlist the suitable candidates for the written test and interview rounds. Applicants initially need to qualify the written test to select for the next round. The Telangana Postal Circle is going to conduct the examination shortly. Candidates applied for the postman/mail guard vacancies can proceed to download the hall ticket from the official portal, telanganapostalcircle.in. The TS postal circle is going to release the admit card before 10 days of the examination (tentatively). Applicants can keep checking the official website to find the hall ticket download link. The Telangana Postal Circle is expected to release the admit cards for postman /mail guard examination before 10 days of the examination. Hence aspirants applied for the postman and other vacancies can keep checking the official portal, telanganapostalcircle.in to download the admit cards. Candidates can find the examination venue, date and time of examination, and other details from their admit cards. Candidate’s name, register number, father’s name, signature, photo etc details will be printed on admit cards. Once go through all the details and report to the authority in case of any misprints in any of the columns. Hopefuls have also instructed that they must carry any of the valid identity proof along with the admit cards. Do not forget to carry both admit card and id proof while going to the examination. Just follow the steps given below to download Telangana Postman/Mail Guard hall ticket 2018. Take a printout and Save it for future use. But bubbled wrong number.Is my omr sheet valid?